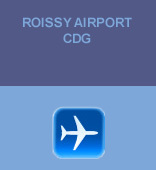 Charles De Gaulle Airport is set 15 miles north east of Paris near the village of Roissy-en-France. It is by far the largest airport serving Paris, it has three terminals, the second of which is split into terminals 2A, 2B, 2C, and 2D. 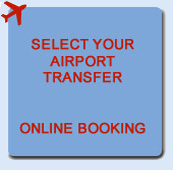 Please select the transfer you need : Private or Shared - Remember that the price per person is decreasing with the number of passengers booked - The more you are and the less you pay per person. Orly Airport is set only 10 miles south east of Paris. It is the second Paris airport in term of trafic but remains very busy. There are two terminals. Terminal West houses only a few airlines, with the older Terminal South handlng most of the long haul routes - Remember that the price per person is decreasing with the number of passengers booked - The more you are and the less you pay per person. Please also keep in mind that a private shuttle is sometimes the best price option for groups of 4 or more. Beauvais Airport is currently mainly served by Ryanair. Remember that airport is 48 miles out of town. The transfer time between Beauvais airport and Paris downtown is usually about 75 minutes but may be longer due to high trafic conditions. Paris Beauvais Airport code is BVA. Other airlines operating from - to Beauvais BVA airport are : Sterling, wizz and also norvegian. 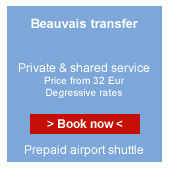 Due to the very long distance only private transfer is available from and to Beauvais BVA airport. Shared or private car service is available for a transfer to Disneyland Paris. 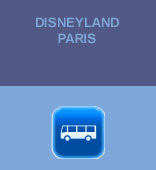 The Paris Disneyland shuttle remains one of the most economical and safe way to go and discover the marvellous Disneyland Paris Park. Transfer is available 365 days a year. Please also keep in mind that a private shuttle is proposed at fixed price : 80€ for 3 or less and 120€ for 6 or less. So if you are a group of 6 people the price per person doesn't exceed 20€. What should you do if someone offers you a cheaper price for your transfer to Paris once at the airport : You must be aware that a few drivers operate at the airports without authorisations or proper insurance, and you may be charged more than you arranged with us when you arrive at your destination. Make sure you get a van with Supershuttle signs on the side.